Doesn’t look like much now, but it will! This is always a thrilling part of the book building process. 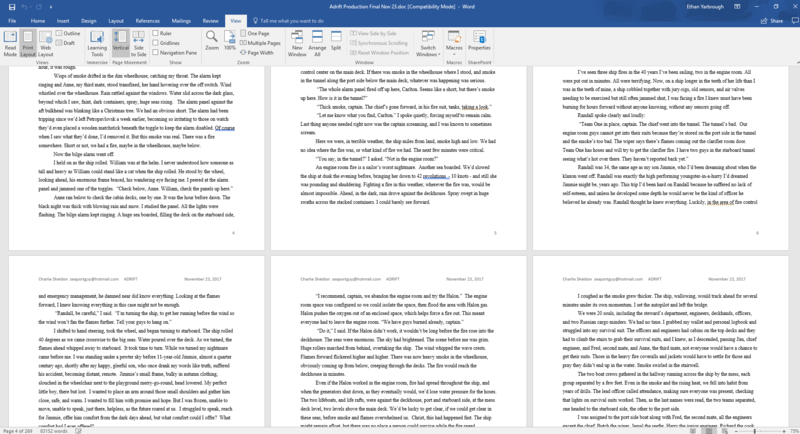 When the author is done writing, the editors are done editing and we can sit down with our designer to start the process of creating the visual and tactile experience of the book-to-be. That was our morning. At a local Starbucks we talked about the story, how it connects with Strong Heart, the first book in Charlie’s series, and what’s new in this latest installment. If you’ve read Strong Heart, you’ll remember William, Tom, Sarah, Myra, Sergei…They’re back in Adrift, along with a whole handful of new characters and another remarkably imagined adventure! So we told our designer, Sonja, the story then sent her off to work her magic on the page design, work in some maps to help readers get their bearings in the cold North Pacific setting of the story, and build the overall experience of the book. We can’t wait for you all to see it. If you want to see Adrift before the rest of the world, sign up for our Adrift mailing list and we’ll send you an exclusive first look copy of Chapter 1 in January 2018. Haven’t read Strong Heart yet? Well, you’d better get a copy so you’re up to speed when Adrift comes out. You can get your copy of Strong Heart at your local independent book store or in paperback, audiobook and Kindle from Amazon. Watch this space for more updates as we build Adrift! 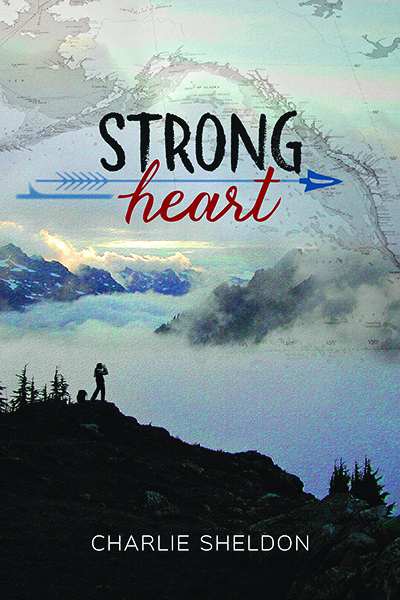 Charlie Sheldon’s novel Strong Heart is FREE to Kindle readers through Saturday, June 3, 2016. It’s FREE! All we ask is that you post a rating and/or review when you’re done reading. Read, Color. Color, Read. Repeat. Introducing Color Stories, the Short Fiction Coloring Book! Color Stories is the coloring book for lovers of story. Color Stories is the fiction anthology for lovers of coloring books. Color Stories is new from Iron Twine Press, available Now! 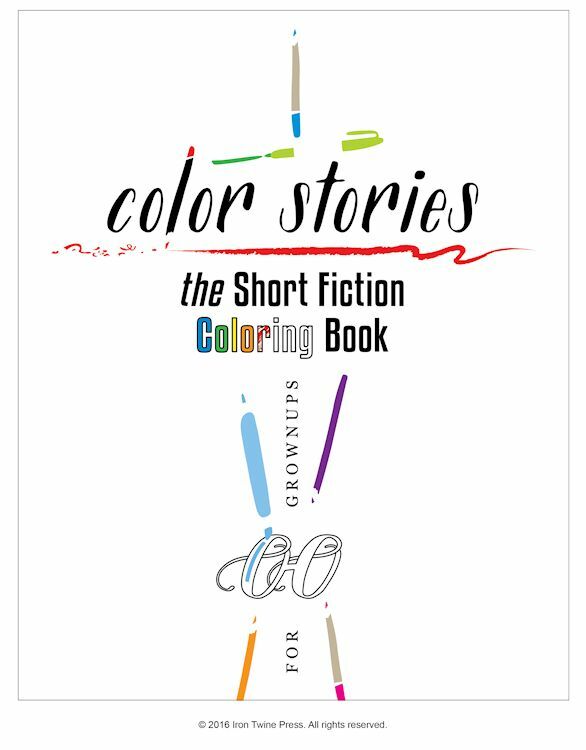 Color Stories presents literary quality short fiction paired with coloring pages! Wait a minute…what is Color Stories? Color Stories is the literary fiction coloring book for grownups! It’s “two great things that go great together” (to borrow a phrase from Reese’s Peanut Butter Cups): vivid flash fiction paired with coloring pages presenting lively and evocative drawings, by Seattle artist Sonja Gerard, inspired by the stories themselves. The stories in Color Stories are the product of a group of innovative Seattle authors. The group meets regularly in Seattle’s Magnolia neighborhood, in an apartment perched on the edge of Discovery Park, “to tell each other stories and inspire each other to craft work that shows something real about the human heart.” The group, comprised of prize-winning authors, including a veteran of the Best American Short Stories anthology series, calls itself the Edge of Discovery Writers, for literal and figurative reasons. They’re serious about their craft. Their new book is seriously fun. Color Stories is the short fiction coloring book your kids will want to color. But it’s for grownups! Color Stories is available Now. And come to Elliott Bay Book Company in Seattle on October 30th at 3 pm for our Color Stories book launch: Storytime for Grownups!